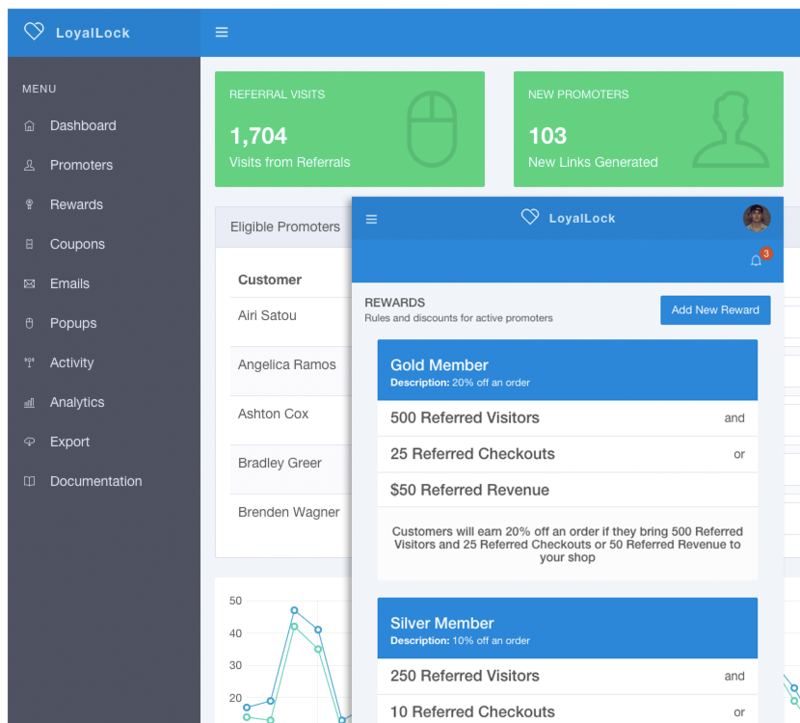 LoyalLock makes it easy to target and reward your most valuable customers. We measure value by the number of visitors & orders a customer refers after checkout. Our Shopify app tracks referred visits, checkouts, and revenue, and automatically attributes this activity to your customers. Our campaign dashboard uncovers referral activity on a rolling basis which enables data-driven decision making for your shop. Establish the kind of activity that should be rewarded with discounts, and let our system automatically reward the eligible customers. LoyalLock helps extend the lifetime value of a customer by providing a rewards infrastructure post-checkout. View active & inactive promoters, as well as promoters who are eligible for one of your rewards. Create promoters on the fly & import existing customers. You can turn individual features on/off, as well as customize color schemes and content to boost referral activity. Our dashboard is optimized for tablets and mobile screens, making it easy to view trends & manage campaigns on the go. Our simple integration enables your shop to track referred visitors, orders and revenue which is then attributed back to the referring customer. Your loyalty program starts here, where customers are automatically onboarded with a unique referral link that they can share with their friends. Let us configure a shorter domain name for your referral links to make them easier to share & to better brand your marketing campaign. Enabling the promoter offer will prompt any referred visitor with a discount code to help increase conversion within your loyalty program. You can create multiple rewards based off of referral milestones, which we'll use to send discounts to eligible promoters. Send one-off rewards or queue up coupon codes in bulk so that your loyalty program can run seamlessly in the background. LoyalLock makes it easy to analyze your most effective methods of brand advocacy for your customers. For shops planning on more than $7,500 in referred revenue, please contact info@loyallock.com for enterprise solutions.